a place where the founder writes about interviews, reviews and personal views on any topics affecting domestic, stray, feral or big cats. Have you ever had an experience so memorable that it changed your entire life? Have you been so impacted by the human-animal bond that you thought about starting a new chapter in your life? Introducing two wonderful people that I met at BlogPaws 2015 in Nashville, TN: Buzz Miller (PACT founder) and Christina Lisk (author and avid cat-lover). I met Christina during one of the lectures, where I easily spotted her in her cat ears headband and animal-print clothing. I noted to myself - "I must talk to her!". A few hours later, I so happened to sit next to Buzz during lunch, where we had a uplifting and enlightening conversation. Both of these lovely people agreed to be interviewed to highlight how their life has been drastically improved by the human-animal bond. Full interview of each person is in audio format in links below. PACT stands for People plus Animals Equals Companions Together (how awesome is that?!). PACT has a network of long-term animal foster families whose humans are serving a military tour, a long-term patient in a hospital or even those who are homeless. They do AMAZING work in this organization! On the left, Buzz Miller and Judy are posing with a dog (formerly in the care of Michael Vick) who was rehabbed. 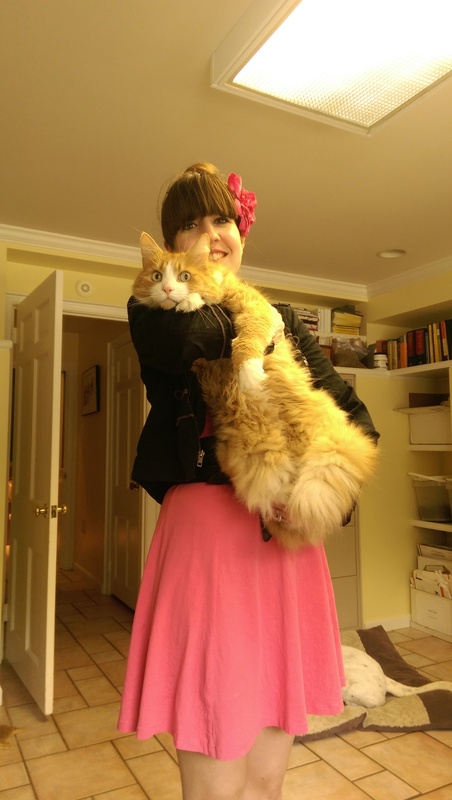 On the right, Christina Lisk is posing with one of the cats from PACT. Click below for the FULL INTERVIEWS BELOW! If you'd like a warm and fuzzy feeling, just watch this video below where a soldier is welcomed home by her cats. Disclaimer: Catlanna's column is a collection of opinion-based articles including interviews, reviews and/or personal views. Views expressed within interview articles represent the opinion of the interviewee, and do not necessarily reflect the opinion of Catlanna, unless specifically stated. Catlanna is not a veterinarian. References will be provided where appropriate, and when permission has been granted.